Tell me true, what should I be eating? Are you overwhelmed, as I am, with all the advice about what to eat in order to ward off the twin boogeymen of aging and Alzheimer’s disease (AD)? I think the supplement industry in particular is intent on confusing me. Researchers at the Rush University Med. Center are offering some clarification in the form of a natural food diet, a large sample-longitudinal study and thorough analysis. They like blueberries quite a lot, and we will explore why. They call their diet the MIND diet, a catchy acronym for “Mediterranean-DASH Intervention for Neurodegenerative Delay”. It emphasizes natural plant-based foods while strongly limiting animal and highly saturated fats and uniquely specifying the consumption of berries, especially blueberries, and green leafy vegetables. It incorporates elements of the Mediterranean diet, which is high in fish, healthy fats, vegetables and whole grains, and the DASH diet (Dietary Approaches to Stop Hypertension) which is strong on fruits, vegetables and low-fat dairy. Both diets have been shown to lower the risk of hypertension and some studies suggest they may protect against dementia. A typical day on the MIND diet might look like this: Three servings of whole grains, a salad plus one other vegetable, a glass of wine, nuts as a snack, blueberries or strawberries (2.5cups/day is super), chicken (turkey) or fish, beans (every other day). Foods to avoid or limit include; butter (1tbs/day; use olive oil instead), cheese, red meat, pastries, sugar and fried, processed or fast foods. From 2004 to 2013, the researchers collected food frequency questionnaires from 923 people ages 58 to 98 who were part of the Rush Memory and Aging Project and living in Chicago-area retirement communities and senior public housing. Participants were scored on how closely their diet matched the MIND, Mediterranean or DASH diets. A total of 144 cases of AD developed in this cohort over the course of the study. On analysis, the authors found that persons whose diet closely followed one of the three diets enjoyed risk factors for exhibiting Alzheimer’s disease symptoms between 39% and 54% lower than the broad average in the group whose diets deviated significantly. They also found that the longer one was on the MIND diet, the greater the benefit. The detailed statistical analysis is here. These are strong results in favor of the MIND diet, at least for the types of individuals involved in this study. AD is, of course, a complex disease. It is multifactorial and for persons with late onset AD, like those in the study, there are many potential risk factors, but no dominant one and little evidence of a strong genetic link. This, plus the fact that an unequivocal diagnostic test for AD is still lacking, means that we should be cautious in interpreting the results, but you have to admit that a good case for a conscientious diet has been made and jumping on board will certainly not hurt you. What’s so good about blueberries? The MIND diet focuses on berries and blueberries in particular. 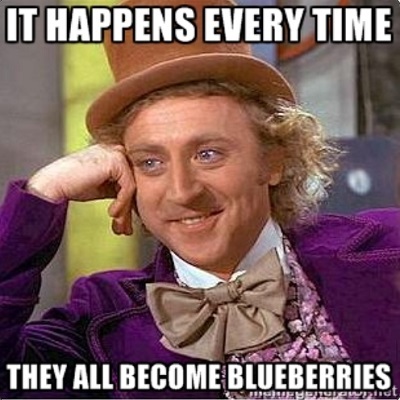 The authors state that, “Blueberries are one of the more potent foods in terms of protecting the brain.” Why is that? The answer is likely to lie in their high antioxidant capacity, but to understand this we need to venture a little ways into the chemistry of oxidation/reduction reactions. A molecule is oxidized when it gives up an electron to another molecule, reduced if it grabs an electron. This kind of reaction is energetic enough to easily change the shape and the function of biological molecules and even destroy enzymes. Oxidation/reduction reactions are of central importance to all of life, one example being the generation of energy in the form of ATP by mitochondria through the electron transport chain, a molecular machine that passes electrons from one molecular to another in a concerted fashion generating ATP along the way. The electron transport chain is somewhat leaky, however, such that high energy electrons can escape allowing side reactions to generate superoxide free radical ions (O2*-) which rapidly form hydrogen peroxide (H2O2) which in turn is converted to the hydroxyl radical (HO*), a highly reactive and destructive molecule. Problems arise because free radicals from this and other sources inside and outside of cells cause damage to membranes, proteins, DNA and RNA. This condition is known as oxidative stress and is the central dogma in “The Free Radical Theory of Aging ” (now in question). We might as well add “The Free Radical Theory of Neurodegeneration” to the mix, because oxidative damage triggers the programmed cell death of neurons (apoptosis) and is one of the factors involved in neuroinflammation. An antioxidant is a molecule that inhibits the oxidation of other molecules by neutralizing free radical intermediates. They do this by being oxidized themselves; by positioning themselves to being burned-up, so to speak. Keeping a handle on oxidative stress is a universal, important and complex cellular activity and multiple types of antioxidants are involved, including; glutathione, vitamin C, vitamin A, and vitamin E as well as enzymes such as catalase, superoxide dismutase and various peroxidases. Insufficient antioxidant activity, or inhibition of antioxidant enzymes, causes oxidative stress that damages or kills neurons. This is where blueberries come into play. The berry contains a rich assortment of antioxidants, all members of a class of plant compounds called flavonoids, compounds with a common polyphenolic structure that allows them to readily accept electrons, an activity that results in very high antioxidant potential allowing them to neutralize free radicals. Organically grown blueberries appear to have significantly higher concentrations of total antioxidants than conventionally grown blueberries, no clue why. Flavonoids have also been proposed to inhibit the pro-inflammatory activity of enzymes involved in free radical production, such as cyclooxygenase, lipoxygenase or inducible nitric oxide synthase. Antioxidants are widely used in dietary supplements. But clinical trials of antioxidant supplements including beta-carotene, vitamin A, and vitamin E singly or in different combinations seem to show no effect. This means that dietary sources are to be preferred. You will be cheered to learn that chocolate and cocoa products are rich sources of flavonoids. Red wine contains the antioxidant resveratrol, which is found in the skin of grapes, blueberries, raspberries and mulberries and has neuroprotective activity. Of course, these are not the only sources. In searching for beneficial plant antioxidants, you will find them in colorful fruits and vegetables. The adage “eat the rainbow” applies. The absorbed flavonoids accumulate in regions of the brain involved in learning and memory, for example the hippocampus. We do not know precisely how the flavonols effect neurobiological processes but some of their actions are believed to occur in two major ways: (i) via direct interactions with cellular signaling cascades that elevate expression of neuroprotective proteins and activate neurostem cells to replace damaged neurons, and (ii) by stimulating blood-flow and capillary growth in the brain. None of this is proven, but it is a fun thought. Further reading: If healthy diets interest you, you will appreciate this March 23 op-ep in the NYT by Dean Ornish, “The Myth of High-Protein Diets”. Also, your comments on this complicated topic are very much appreciated.